AmericanOne Fence & Railing is a Northeast Ohio Manufacturer and Distributor supplying Trade Professionals with MAINTENANCE-FREE Fence, Railing, and Deck materials. Our products are made of the finest materials and are engineered to provide a lifetime of service with virtually no maintenance; and we ONLY sell to TRADE PROFESSIONALS. If you’ve ever owned a wooden deck or fence, you know how much time and money is spent on maintenance. In the beginning, wood does cost less than vinyl or aluminum, but it ends up costing much more over time. In keeping with our mission to provide the BEST and MOST INNOVATIVE products in MAINTENANCE-FREE fencing, decking and railing. We sell and specialize in Aluminum and Vinyl products. We test all of our products in-house before we sell them to our customers to make sure they achieve our HIGH STANDARDS of endurance and strength. We also are always striving to create and invent products that fulfill a need in the Fence Industry, such as our patent pending Puppy Guard add-on panel that is exclusively sold by AmericanOne Fence & Railing. 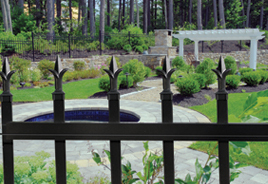 Our knowledgeable staff has over 40 years in the Fence Industry each. We want YOU to look good to YOUR customers! Let us show you how to create “STYLE and SECURITY with a VIEW” for every one of your customers!